My name is Alwina, I'm 24 years old, and I'm a graphic designer from India. I don't follow any one designer or any particular style strictly; I go with my mood. One day I'm in a full black skirt and top, and the very next day you will see me in a pink flowy dress. But the single thing I am very particular about is that I want my clothing to be unique, stylish and fully covered. Be it a long tunic with jeans, or a skirt - skirts and denims are my favourites. I love to accessorise a lot with chunky bracelets and huge rings. I shop almost everywhere, from streets to top designer showrooms; my wardrobe is full of clothes. For style inspiration I often refer to Bollywood and Lakme Fashion week or other such shows by my favourite designers including Tarun Tahilani, Anamika Khanna, Anita Dongre and Sabyasachi. I mix and match from these collections and then convert it to a hijabi version! I have previously worked with designer Arjun Khanna for prints, as I am a graphic designer. The newest and latest, unexplored color combinations attract me a lot. But the basic mantra of my life is to experiment! For my wedding outfit, I wanted it to be completely white during the nikah, but for the walima party I preferred a totally different look - very dramatic in all red. 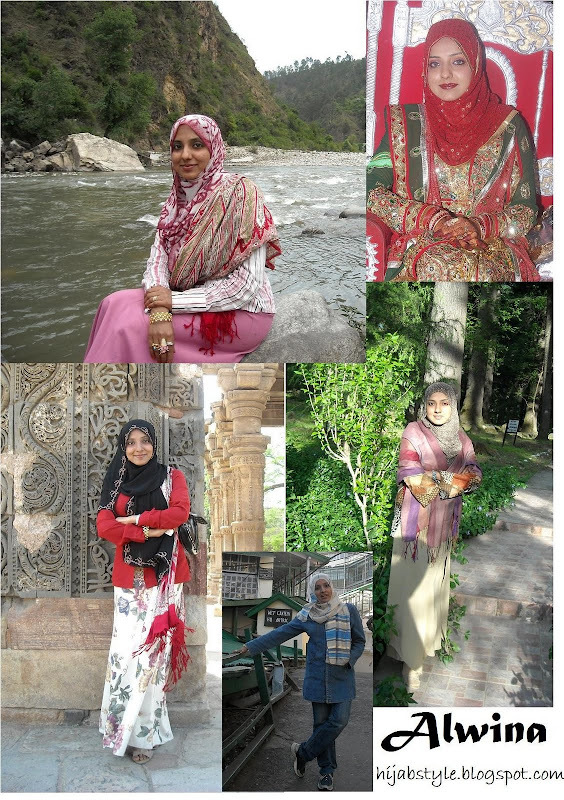 The red dress (top right) was from a showroom, but when I bought the dress the sleeves and blouse were both short, so I chopped the duppatta to make the sleeves and blouse a little longer, which also gave the dress a unique contrast look. I also dyed the stole and headscarf to go with the dress. I love modesty in my clothing, so whenever I feel my dress is a little tight or the top is short, I throw a stole over my shoulders to make my dress look more modest and stylish. Wear anything and be confident. Always be sure of yourself; if you are at ease with yourself, everyone will love your style. She's looking great and lovely in every pic. She understand very well the meaning of covering modestly. Nice sense of style. All look beautiful..but especially love how she looks so casual and comfortable in her jeans w/pretty hijab.